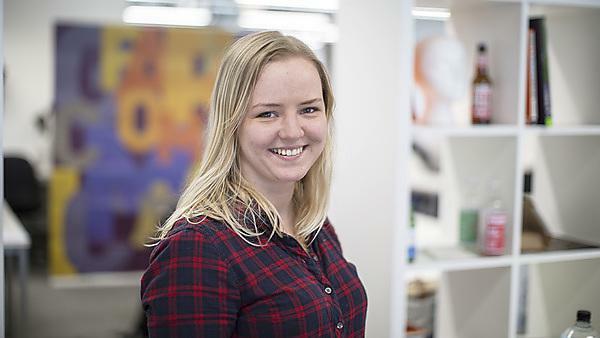 Eva Dage came from Latvia to study at Plymouth. She graduated from BA (Hons) Graphic Communication with Typography in 2014 and now works as a Visual Designer for IBM in Hursley, Hampshire. I went to D&AD New Blood exhibition in London straight after university. This was a great taster session for interviews and possible job opportunities. A month later, I got a job at e3 Media, which is a digital design agency in Bristol. I moved there to start my career as a graphic designer. The company was rebranded recently and is now called Great State. I worked there for two years and then fancied a change and got employed by IBM in Hursley and moved to Hampshire. After six months, IBM sent me to Austin, Texas to work there for three months. So far, I’ve been working at IBM for a year and a half and been pretty happy about it. I’m feeling pretty content because everything seemed to work out the way I wanted, even though finishing university was a bit of a ‘shock, horror'. Suddenly, you hit real-life in every sense. University was a soft taster session of what was going to happen in my career, and a good introduction to my life choices. Without it, I could not stand where I am now, or at least, it would’ve been pretty impossible. There have been lots of great moments. Probably the biggest and most memorable was to have an opportunity to live and work in Austin for a bit. design your professional personality for three years solid. Image (L-R): Graduates Shaun Lynch, Danny Skinner, and Eva Dage. All currently work at IBM and returned to the University to take part in a BA (Hons) Graphic Communication with Typography event and work with current students for the day. In terms of location, I just moved from another country and was ready for a whole new and open-minded adventure. The facilities are great. I got heavily hooked on letterpress and silkscreen printing, which I loved. The modern graphics studio was another reason for choosing Plymouth, with its forward-thinking and modern approach. Work placement (offered as part of the Graphic Communication with Typography course) would’ve been a cherry on top. The library was great, the sports complex was very good with a good range of classes and awesome trainers. In terms of directly related support to my career, I found that the most valuable thing to me was the guest lecturers and student societies. As a student on Graphic Communication with Typography, you can explore our range of printmaking workshops - etching, lithography and silkscreen. Alongside these, you'll have access to professional photographic studios and Apple Mac workstations. Develop innovative ideas and concepts in response to design briefs, and creatively solve design problems using words and typography. With employers placing great emphasis on graduates having typographic knowledge, you’ll stand out in the job market. Good graphic communication relies on the important relationship between type and imagery... Or maybe type can be the image?